(Phys.org)—There are many experiments that physicists would like to perform on antimatter, from studying its properties with spectroscopic measurements to testing how it interacts with gravity. But in order to perform these experiments, scientists first need some antimatter. Of course, they won't be finding any in nature (due to antimatter's tendency to annihilate in a burst of energy when it comes in contact with ordinary matter), and creating it in the lab has proven to be very technically challenging for the same reasons. Now in a new paper published in Physical Review Letters, Alisher S. Kadyrov, et al., at Curtin University in Perth, Australia, and Swansea University in the UK, have theoretically found a method to enhance the rate of antihydrogen production by several orders of magnitude. They hope that their finding will guide antihydrogen programs toward achieving the production of large amounts of antihydrogen for long confinement times, and at cool temperatures, as required by future investigative experiments. "Laws of physics predict equal amounts of matter and antimatter created after the Big Bang," Kadyrov, Associate Professor at Curtin University, told Phys.org. "One of science's mysteries is where did all the antimatter go? To unravel this mystery, scientists at CERN [the European Organization for Nuclear Research] plan to do gravitational and spectroscopic experiments with antimatter. The simplest example is antihydrogen. However, it is challenging and expensive to create and study antihydrogen in the laboratory." 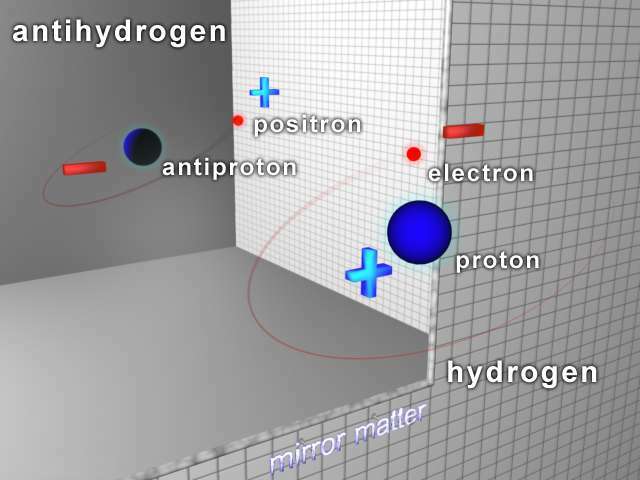 Antihydrogen is an appealing form of antimatter for scientists to study in part because it is electrically neutral: it consists of an antiproton (a negatively charged proton) and a positron or antielectron (a positively charged electron). Because it's made of just two antiparticles, antihydrogen is also somewhat easier to produce than larger antiatoms. In 2002, scientists produced antihydrogen in the first dedicated antihydrogen production experiment at CERN, and in 2010 they confined antihydrogen in traps for up to 30 minutes. Eventually, however, the antihydrogen annihilates, such as by impacting the walls of the experimental apparatus or interacting with background gases. There are a few different ways to produce antihydrogen in the lab, all of which involve colliding or scattering particles off one another. In the new study, the physicists focused on the reaction in which an antiproton is scattered off positronium, which is a bound state consisting of a positron and an ordinary electron. In a sense, positronium can be thought of as a hydrogen atom in which the proton is replaced by a positron. So far, the antiproton-positronium scattering reaction has been investigated mostly when the positronium is in its ground state. In the new study, the scientists theoretically showed that antiproton collisions with positronium in an excited state instead of the ground state can enhance antihydrogen production significantly, particularly at the lower energies. "Our calculations show that a very efficient way of producing antihydrogen is to bring together slow antiprotons with positronium, which has been prepared in an excited state, something that is now routine using lasers," Kadyrov said. "It turns out antihydrogen formation increases by several orders of magnitude for positronium in excited states as compared to the ground state due to unexpected low-energy behavior revealed in our calculations." For the first time, these theoretical results allow for realistic estimates of antihydrogen formation rates via antiproton-positronium scattering at low energies. Because lower energies are more important in experiments than higher energies, the scientists hope that this method will offer a practical way to create cold antihydrogen, which could then be used to test the fundamental properties of antimatter. "Scientists from the ALPHA, ATRAP, AEgIS and GBAR Collaborations at CERN are working on producing and trapping antihydrogen in sufficient quantities for experiments on the spectroscopic and gravitational properties of antihydrogen," Kadyrov said. "We believe that the efficient mechanism for antihydrogen formation that our research has unveiled could be used to facilitate these investigations." The scientists plan to investigate this antihydrogen production mechanism more in the future, with the goal to achieve even better results. "Presently, positronium can be excited to high-energy states, known as Rydberg states," Kadyrov said. "Next we want to investigate antiproton collisions with positronium in such a state. Given the magnitude of the enhancement we have got for the lower excited states, one can expect that the corresponding enhancement would be enormous. This then could open a very promising way of producing low-energy antihydrogen beams for spectroscopic experiments, for example, for measurements of hyperfine splitting in antihydrogen."